The Parrot USA store has launched an early Black Friday deal, they are offering the new condition PARROT BEBOP 2 FPV drone for $299 with free US Express shipping. No coupon code is needed, the price you see is the price you pay. Among the Monday Woot daily deals, running until 1am ET on Tuesday [or earlier if sold out], you can get the new condition Parrot Jumping Night Mini Drone for $27 with free shipping for Prime members. You have a choice of three colors and up to ten units per Woot customer during the sale. It comes with a 1-year warranty from Parrot and it has a wide angle camera streaming through your phone. From the Four Figure Fujis we go back to something you can pay for with an ATM Vomit Paper ($20 or less). I hope no one reading this is eating 🙂 Clearance/refurbished specialist Tanga is offering the refurbished Parrot Rolling Spider Helicopter with HD Camera for $15 with free shipping and free returns. It is available in white or blue color schemes. It comes with a 90-day warranty or optionally you can purchase a replacement plan for +$4 (1 year) or +$5 (2 years). It’s coupon time for the official Parrot USA store as well. Coupon code ALL15 gets you 15% off store wide with the exception of professional products. Free shipping with orders of $30+. Coupon expires Valentine’s night. Of quadcopter and assorted accessories interest. Another one of the item in their sale is the “New – Other” condition Samsung Gear 360 Degree Camera offered for $70 with free shipping and a 1-year warranty. If you are interested in Parrot drones, coupon code FLYINGDEALS gets you 20% off select Parrot drones at the official Parrot USA store. Coupon expires 4/17/17 (unless extended). The national talk like a parrot day came and went, but you can buy a Parrot drone at any day of the year, the Parrot BeBop Drone Quadcopter is on sale for $200 with free shipping until 11/16/16 (or earlier if sold out) in three colors at Adorama as follows: red color OR yellow color OR blue color. If you like fisheye drones, the Parrot Bebop Drone 2 (Wifi) with its 14mp fisheye camera is on a special promotion at the Dell Home. You pay $500 which is the price at other retailers as well, but when you add it to the shopping cart, a $100 promotional Dell eGift Card magically appears in the shopping cart. The promo eGift Card will be emailed to you 10-20 days from ship date and expires in 90 days after that. Sort by highest price to quickly locate the two $499 models. Only the $499 models are eligible for the eGift Card promo. The offer expires 6/13/2016 6:59am. 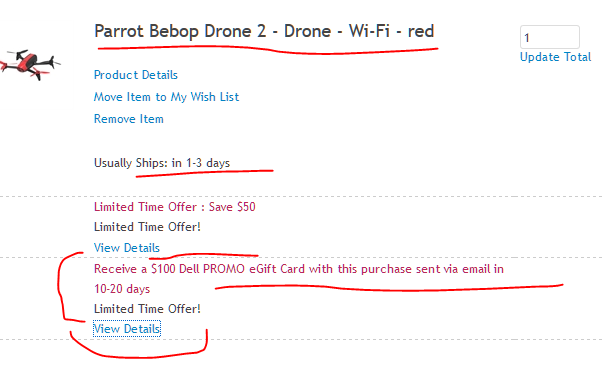 A parallel promotion with the same expiration is running on the Parrot Bebop Drone 2 w skycontroller which goes for $700, along with the $100 promo eGift Card as above. We keep droning on, with another offer, the Dell Home store is offering the Parrot AR.Drone 2.0 Elite Edition Quadcopter for $250 with free shipping and a $50 Dell promotional gift card to be used in future Dell purchases. Details on the promotional gift card when you click on it over there. Promotion ends 4/25/2016 6:59am Dell time.